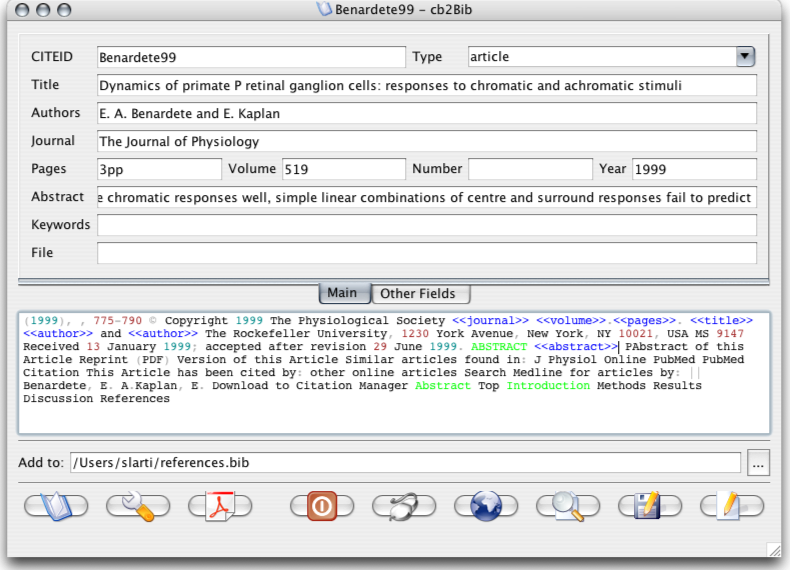 The cb2Bib is a free, open source, and multiplatform application for rapidly extracting unformatted, or unstandardized bibliographic references from email alerts, journal Web pages, and PDF files. The cb2Bib facilitates the capture of single references from unformatted and non standard sources. Output references are written in BibTeX. Article files can be easily linked and renamed by dragging them onto the cb2Bib window. Additionally, it permits editing and browsing BibTeX files, citing references, searching references and the full contents of the referenced documents, inserting bibliographic metadata to documents, and writing short notes that interrelate several references. If you need more information please contact the developers of cb2bib (molspaces), or check out their product website.